Netcomm NWL-11 dual band CDMA IP Router with Ethernet IP connectivity, its lightweight, compact design makes it suitable for a broad range of applications internal antennas/ external antenna option. 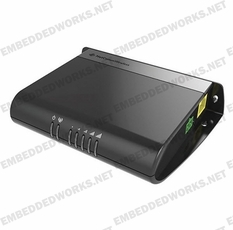 The NWL-11 is a high performing dual band CDMA IP Router that delivers speed and coverage of a wireless network. Designed for plug and play Ethernet IP connectivity, its lightweight, compact design makes it suitable for a broad range of applications. The device incorporates state-of-the-art M2M features; internal antennas - with an external antenna option, flexible mounting options, wide temperature range and flexible powering options such as POE 802.3af. The device enables you to remotely connect your assets, premises or equipment to gather real-time business insight and streamline your business operations. 1x RS232 Serial Port DB-9 female DCE supporting either 9 wire RS232 or RS485/RS422 (software selectable). EMC Approvals FCC, PTCRB, CE, GCF, REACH, WEEE, e-mark, RoHS,A-Tick, IC.